Thanks to former Mrs. Oregon, Erin Piibor, for hosting the Pumper Car at the University of Oregon’s outdoor tennis courts this past Sunday afternoon. Several of Erin’s wonderful friends stopped by to have their child ride a Pumper Car for the first time. 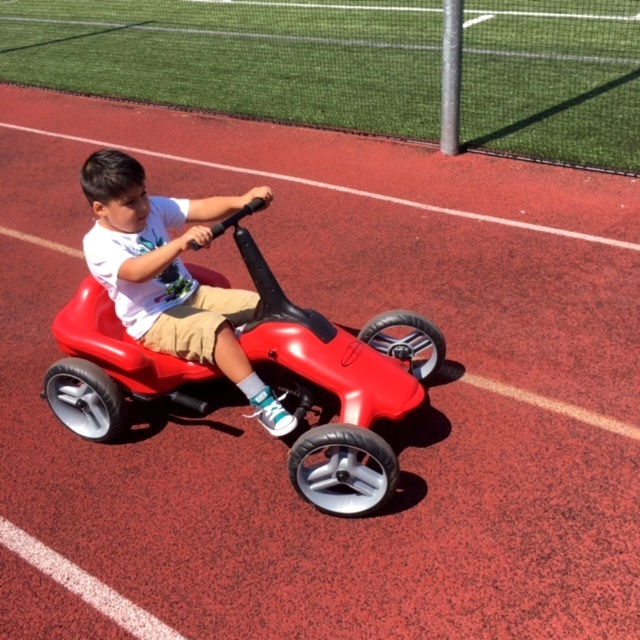 The kids had a blast taking off pumping around the track and testing out the brakes of course! The parents were happy to see that along with being fun the Pumper Car was also challenging and a workout. Towards the end of the event a fun-spirited six-year-old boy named Sebastian with Spina Bifida came in on a wheel chair. Sebastian, once on the Pumper Car, took off around the track laughing and challenging his buddy to a friendly competition. The two boys enjoyed racing around the whole track and didn’t even mind the heat! We are happy to be “The ride that emPOWERs kids of ALL abilities”. To learn more about how the Pumper Car has helped children with disabilities check out our Just for You section.